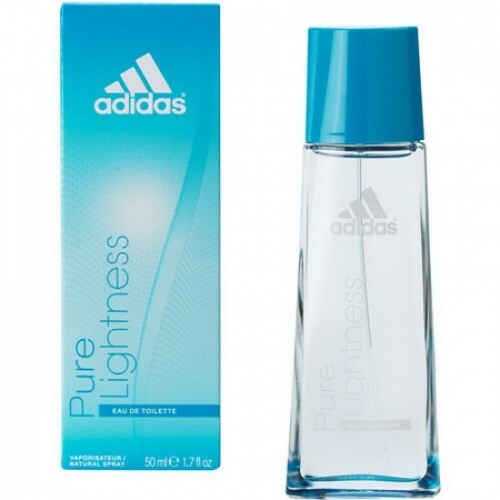 Adidas Pure Lightness is a floral fruity fragrance for women on the go. Adidas Pure Lightness 50ml. Eau De Toilette is a floral fruity fragrance for women on the go, and is perfect for sports or day activities. Top notes are succulent melon and red apple; middle notes are heady jasmine, lovely magnolia, violet and innocent lily-of-the-valley; grounded in a light musk base. This is a fruity-floral. It is very fresh and light, ideal for spring and summer wear. Gives you a pleasant feeling of coolness and evoke a sense of peace, even in the hottest days. From the beginning you will feel extremely fruity essence, especially the irresistible aroma of apple. The whole essence gives vitality and shine due delicious melon. Gradually tones are balanced fruity floral essences full of freshness. A fresh and fruity aroma penetrates the delicate floral tones of magnolia and lily. Ii whole composition is added aroma of jasmine flowers, which highlight the strength and tenderness of violet. Base notes are composed of wood sensual musk. Eau de toilette, Pure Lightness is incredibly easy, pleasant refreshing and full of optimism. This means it can be worn anytime. It is extremely energetic, but because flower essences is classic and feminine. Sometimes acting in tender and delicate violet because agreements. Pure Lightness is perfect for the active woman who loves sports. This fragrance is able to perfectly highlight the determination and strength of every woman. However, discreetly evokes beauty and feminine charm. Aroma is perfect for active women and for the romantic and feminine. Pure Lightness is a fragrance day. It is ideal for any activity, from sport to casual walking or shopping. But neither service will not disappoint, fitting in perfectly with the style of dress but with the casual office.